What is The Mucoid Plaque? Home/What is The Mucoid Plaque? Mucoid plaque (also known as chronic feces) is created when the body produces mucus to protect itself from potentially toxic substances. Mucoid plaque acts as a health threat by reducing the absorption of nutrients, impairing digestion, providing a haven for parasitic microorganisms, behaving as a reservoir of toxins, promoting the development of cancer, causing skin conditions and allergies, and reducing bowel transit time. The average person has 10-20 pounds of this toxic mucoid plaque (See Image Below). The 3 Day So Easy Colon Cleanse is the ONLY cleanse on the market that removes the mucoid plaque in only 3 days. 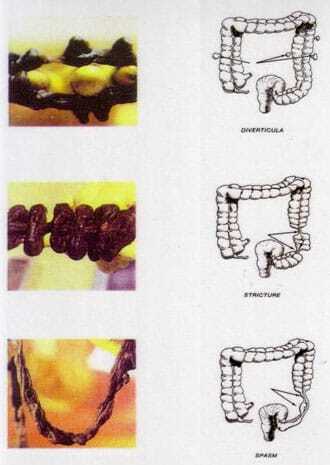 It does this by using a patented fiber found in NO other product on the market called oil palm trunk fiber. This fiber penetrates the mucoid plaque, lubricates the colon wall and the mucoid plaque just “slips” out effortlessly. This is how it works in just 3 days – please read our verifiable testimonials on how people lose up to 20 pounds in just 3 days.